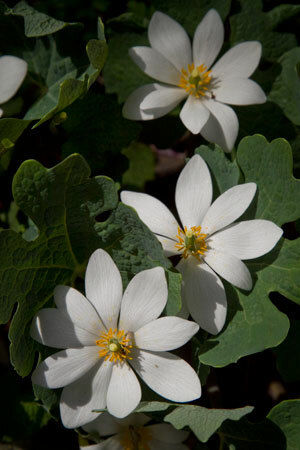 Bloodroot grows wild in North America and has been used by herbalists for centuries. It is not commonly prescribed because of some safety concerns that exist. Bloodroot irritates tissue and can cause cell death at higher doses. It is classified as an escharotic because it destroys tissues to produce an "eschar" or scab. Bloodroot applied topically to warts causes shedding of the outer layer of skin and removal of the lesion. Herbalist once applied "black salves" containing bloodroot and other caustic compounds (e.g. zinc chloride) topically to cancers and other skin lesions. However "black salves" are not recommended because they can cause serious disfiguring tissue damage and safer treatments exist. Internally, bloodroot was historically recommended for bronchitis associated with significant mucous. Because it is irritating to mucous membranes, small amounts increase the hydration and volume of mucous produced in the lungs making it a useful expectorant. The roots contains isoquinoline alkaloids (e.g. sanguanaire) that also possess antimicrobial actions. Caution: bloodroot is toxic and should only be used under the supervision of a qualified healthcare provider.